This example demonstrates how the AnimationType and Interpolation properties affect the rate at which the value of a property changes under their control. This is illustrated by controlling the X and Y of a TRectangle with TFloatAnimation instances. The Interpolation properties on the TFloatAnimation objects are set to itLinear, making the change of X and Y constant over time. The Interpolation andAnimationType properties of the TFloatAnimation instance can be set in the Object Inspector to any TInterpolationType and any TAnimationType. 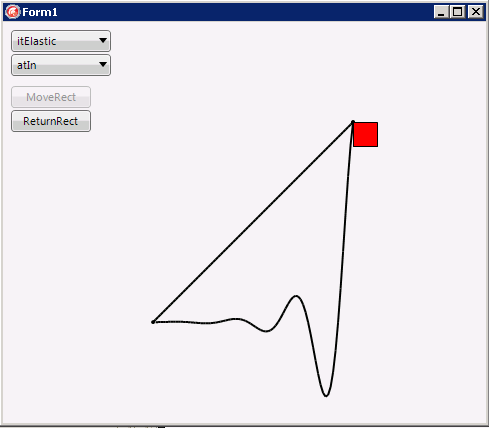 Drawing of the path is done using the DrawLine method of the form's Canvas. 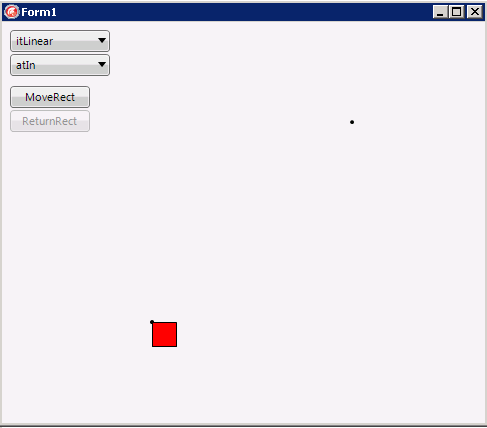 Points are collected and drawn using a TPointF array in the animation's OnProcess event handler and then redrawn in the form's OnPaint event handler. The TFloatAnimation instances have to be created as children of the TRectangle. Many of the TFloatAnimation properties can be set at design time. Rename the buttons to MoveRect and ReturnRect. Using the Object Inspector, add event handlers for the Form1.OnCreate, MoveRect.OnClick, ReturnRect.OnClick,FloatAnimation1.OnProcess, and Form1.OnPaint events. Fill in with the sample code below. The form should look like the following image. After clicking the MoveRect button, the rectangle moves according to the selected options, drawing a line from its upper-left corner.